create my A2 sized card. I then cut out a piece of DSP (Designer Series Paper) from the 6"x 6" stack of Playful Palette. I cut this piece to 1-1/2"x 5-1/4". I got out a piece of Blushing Bride cardstock and cut this to 4"x 5-1/4". 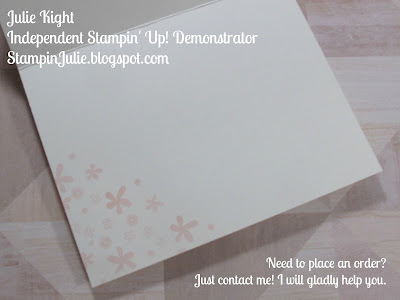 Then I got out a piece of the FREE Sale-a-Bration Glimmer paper in Sweet Sugarplum and cut a piece to 1/2"x 5-1/4". wanted to use one of the groupings for the background on the Blushing Bride piece. I used the stamp with the little flowers. I wanted a tone-on-tone look so I used the ink pad Blushing Bride. I stamped the stamp several times at an angle twisting and turning the stamp to make the flowers fit well. This was very easy to do because, this stamp set is photopolymer which means it is a clear stamp. I wanted to do this first before I glued it down and the little piece of DSP on top so that I could stamp off the page and it looks continuous. Then, I went ahead and glued the Playful Palette piece on top, and lined it up at the very bottom of the Blushing Bride piece. I then took the Glimmer paper and glued it on top of the two pieces. Next, I glued the whole piece onto the Very Vanilla card base. match the squares in the Playful Palette paper, so I picked a stamp that would fit well. 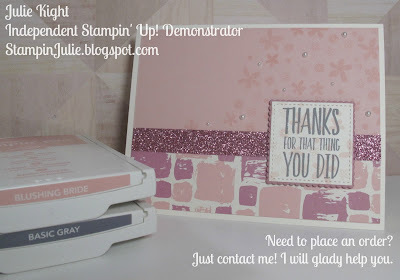 I started with stamping on a piece of Very Vanilla with the same stamp I used on the background in Blushing Bride again. After I stamped an area the I knew would be big enough, I went ahead and stamped my sentiment using Basic Gray. I wanted something softer then Basic Black. Using my Big Shot, I die cut the stamped piece with the Stitched Shapes Framelits making sure I had it all lined up. 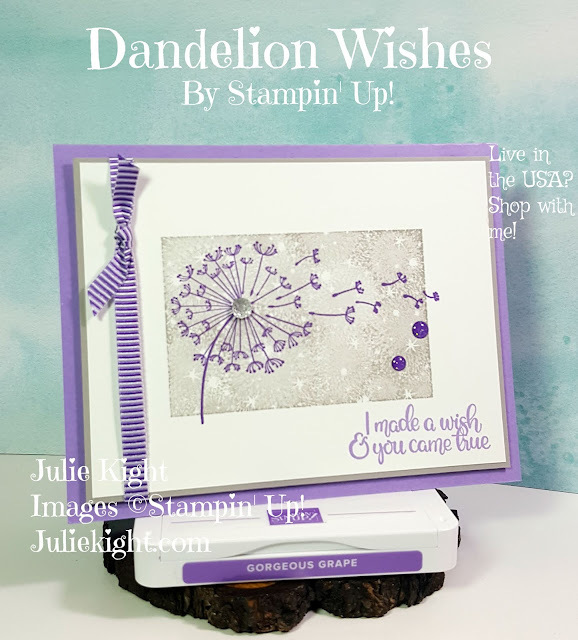 Next, I took a piece of Sweet Sugarplum cardstock and die cut it with the Layering Squares using one with the scallops. Then I glued the two pieces together. 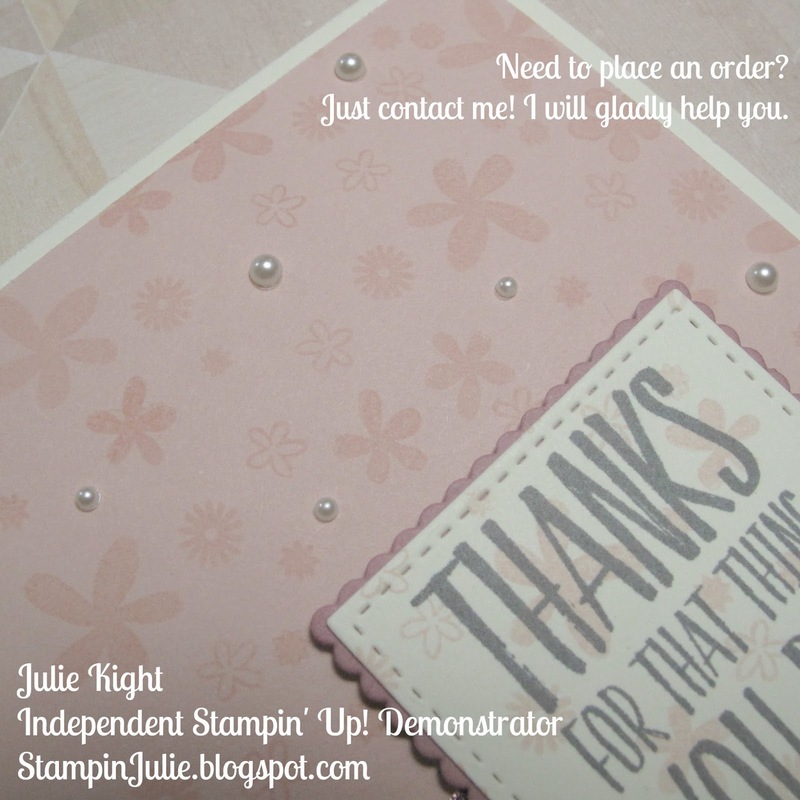 I placed Stampin' Dimensionals on the back and placed it onto the card over on the right just like the sketch. on the right side. I used two different sizes. I then wanted to decorate the inside of the card so I stamped the same stamp I had used for the backgrounds and stamped in Blushing Bride in the left bottom corner. And I am all finished! 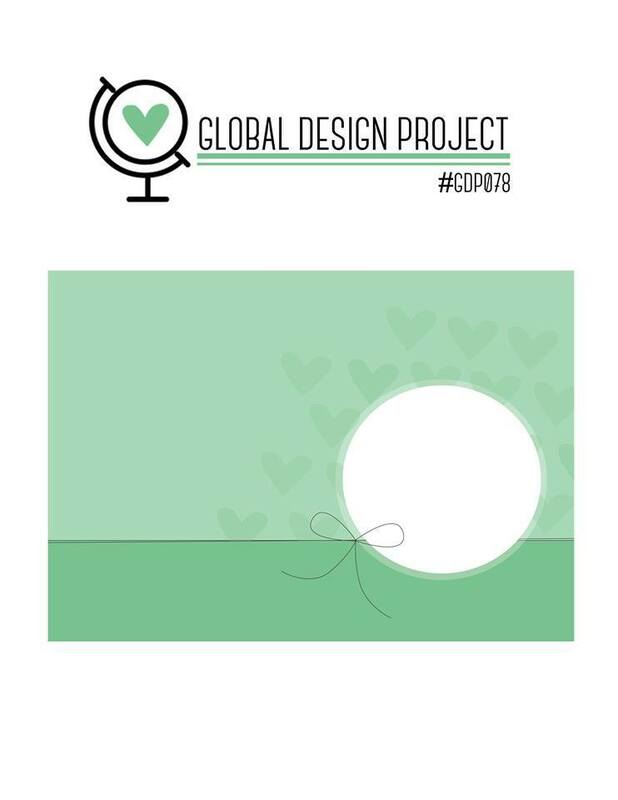 If you need to purchase any of the items I have used in this project please go here. Thank you so much for coming to my blog today and checking out my card. I think it came out pretty good. I really love pink, it is my fave color so it is always fun to use. If you have any questions contact me here. Only 14 days left for Sale-a-Bration! the year! Don't miss out on free product. 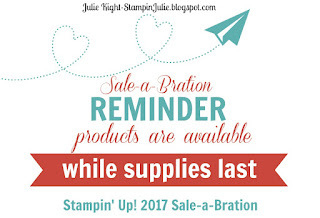 For every $50 (before tax & shipping) you spend, you will get to pick a free item from the Sale-a-Bration brochure. Go here to starting ordering and get your free items. 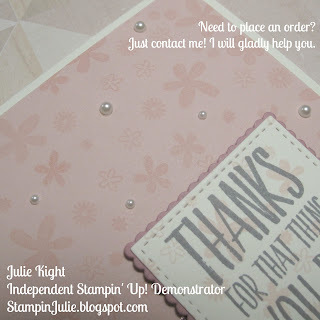 Get to chose from over 10 products from stamps to paper to ribbon...all FREE. 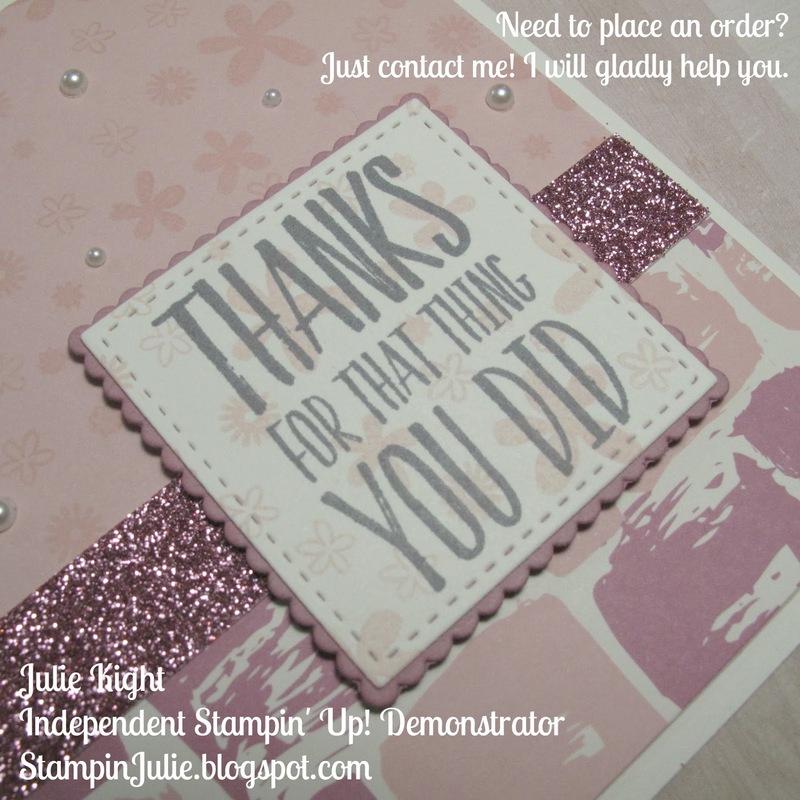 But remember this, Stampin' Up! has told us that all items are now only available while supplies last. The Card Tin, #143833, has sadly already sold out! Get your Sale-a-Bration items NOW! ink, paper, and such. 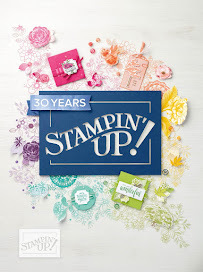 Now this only lasts until March 31st too so if you love everything Stampin' Up! and would love to receive a discount up to 25% off all your future orders then go here and click on "Join The Fun". Remember that the Starter Kit only costs $99 for $125 worth of your choice of product. And you get free shipping! And one more special! Only until March 31st if you place an order for $250 (before tax & shipping) or more you will get an additional $25 in Hostess Rewards! 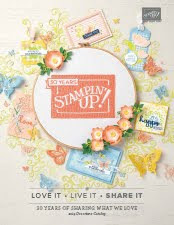 That is $25 in FREE rewards you get to spend on anything in any current Stampin' Up! catalog. Plus, you get 5 Sale-a-Bration items. Get orders from family and friends to up your total to get this great offer. Go here and click on "Shop Now" to place your online order. Any questions? Then please go to the same page and click on "Contact Me".